Marvel Knights “Iron Man: Extremis” and “Spider-Woman: Agent of S.W.O.R.D.” are two decent motion comics which I’m certain will thrill fans of each character and the comic book they are based upon. For me, I’ve never been a big fan of the motion comic but even so, they are entertaining and at a low price is worth picking up especially if you don’t already own the individual DVD releases. 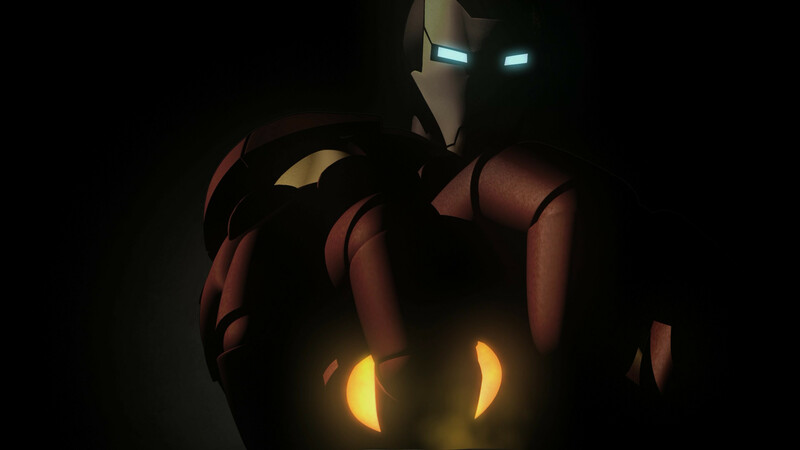 The origin of Tony Stark into Iron Man is retold in flashbacks and against the backdrop of a new chemical called “Extremis”. This chemical was stolen from a laboratory and injected into an unstable subject with severe and dangerous consequences as the subject becomes delusional and begins massacring anyone that comes across his path and pisses him off. Stark is brought in by an old friend and the inventor of the chemical to find the subject before it’s too late. Jessica Drew is recruited into the S.W.O.R.D. (Sentient World Observation and Response Department) by Agent Abigail Brand. This organization, unlike S.H.I.E.L.D. or The Avengers, was created to monitor and capture criminal elements from other worlds and planets that invade Earth. Her first assignment is to hunt down and capture a Skrull, a being with the ability to design himself as anybody. Growing up, I’ve always been a DC fan so Marvel Comics and its characters never were on my radar. Now with the influx of feature films (Iron Man, Thor) and a few television series (“Wolverine and the X-Men”, “The Avengers: Earth’s Mightiest Heroes”), others like myself are introduced to these characters outside of the comic books. In these two features we get a motion comic, using artwork with voiceovers and/or added motions to animate it more. I’ve never been a fan of the motion comics though with the lip movement in Iron Man: Extremis, it made it easier to watch; this was not the case in Spider-Woman which took some time getting used to as they use single panels for conversations and it was also a bit odd to watch as it almost looks like they’re speaking telepathically. Save for the motion animation style, the stories themselves are good and present a good mystery and suspense in each one. For “Iron Man: Extremis”, we get to follow Tony Stark as he tries to grasp his own past and what he does, trying to atone for what he and his father had created. During this time, he also helps out an old friend to track down a monstrous killer. 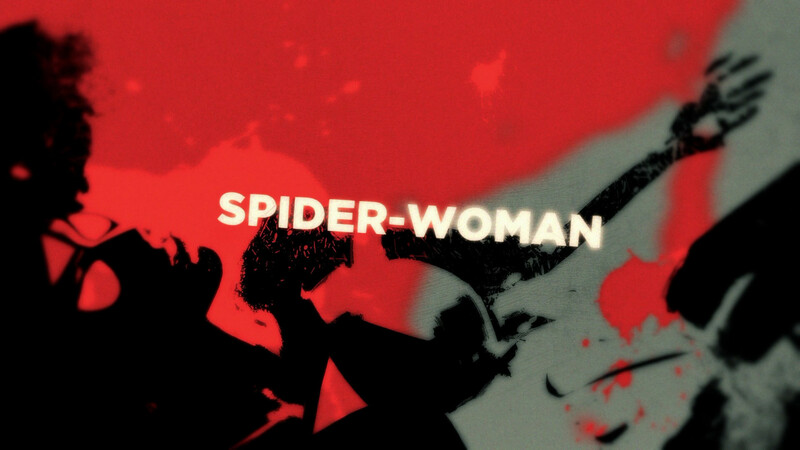 In “Spider-Woman”, this is much more of a gritty crime suspense-thriller with the main character under immense psychological pressures to catch this Super-Skrull who plays mind games and nearly causes severe paranoia. As it stands, both of these are fine and entertaining stories and with the combined running times being around 120-minutes (without opening or end credits), they’re worth checking out if you have not already since both are currently available on DVD. 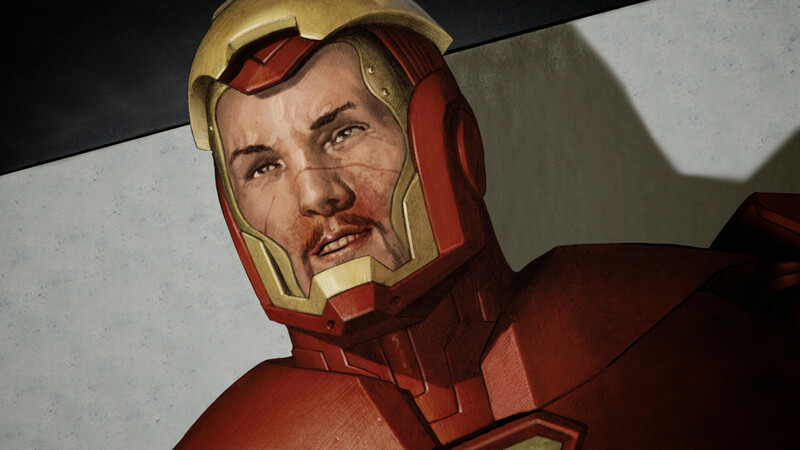 A Conversation with Iron Man Artist Adi Granov (16:55; SD) – This interview with Granov is fairly interesting as the artist explains the story behind Extremis and how he approached the design behind the characters. Behind the Scenes of Marvel Knights Animation (5:13; SD) is a short featurette on the new animation studio covering how the motion comics, including “Astonishing X-Men”, were made from the comic book to storyboards, script and voice acting. Behind the Scenes of “Iron Man: Extremis” (13:32; SD) is a 3-part featurette chronicling how the motion comic came to be from the voicing acting, putting together the artwork and motions to make it come alive, etc. “Ready to Go” Music Video (Iron Man) (3:10; SD) and “Watch Your Step” Music Video (Spider-Woman) (3:06; SD) are two music videos from each motion comic you can check out. Marvel Super Heroes: That The-?! Starring Iron Man (3:12; SD) – This spoof using an Iron Man action figure hosting a game show with various people from Marvel Comics (also using the action figures for Thor, Captain America, War Machine, etc) along with the real writers/artists. 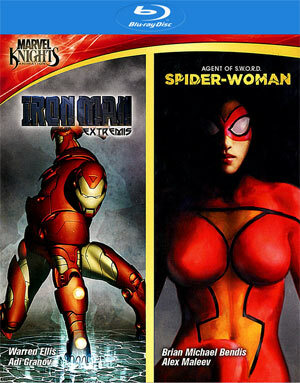 Visual History of Iron Man and Visual History of Spider-Woman is a gallery showcasing the various designs, and suits, of Iron Man from the beginning to current issues. 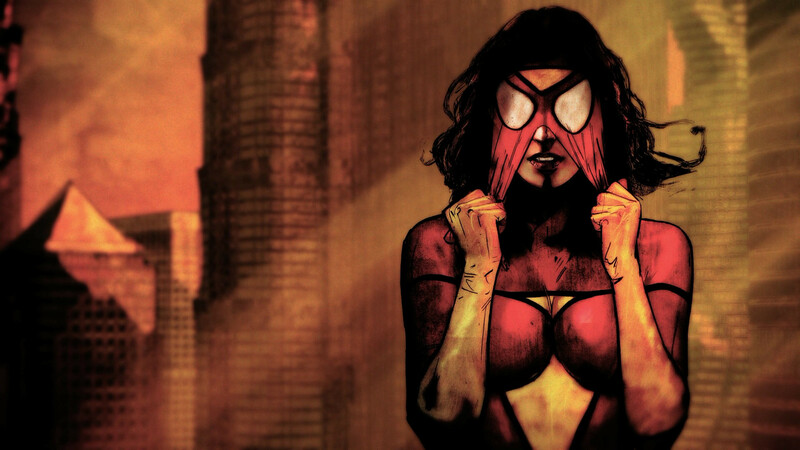 For Spider-Woman, we get to see panels from different issues of the comic book. Adi Granov Artist Gallery and Alex Maleev Artist Gallery is basically the same as the above this time getting to see the cover artworks from both of these artists, Granov for Iron Man and Maleev for Spider-Woman. Finally we get trailers for “Iron Man: Extremis”, “Spider-Woman: Agent of S.W.O.R.D.”, “Astonishing X-Men: Gifted” and “Black Panther”. Both “Iron Man: Extremis” and “Spider-Woman: Agent of S.W.O.R.D.” makes their debut on Blu-ray with a 1080p high-definition transfer. It’s tough to judge the transfers since they are primarily animated stills with minimal movements but from what I could tell, the picture looks fine though I could see some banding during the opening credits. The colors however did look good with no signs of bleeding or oversaturation. 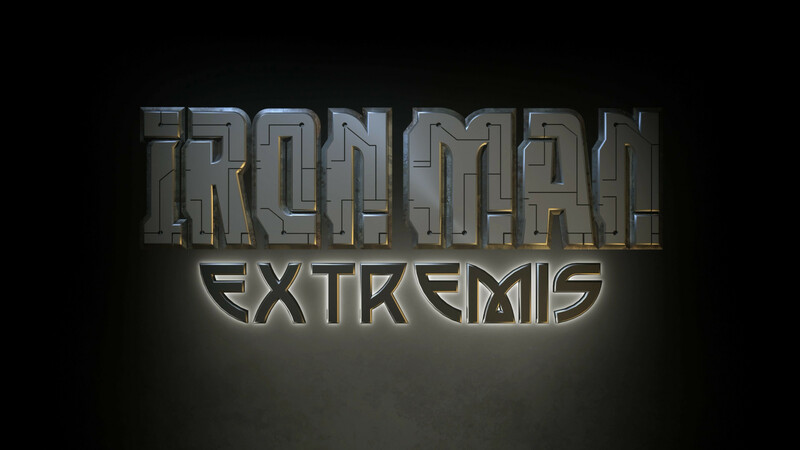 “Iron Man: Extremis” has been given a fine DTS-HD MA 5.1 lossless track that shows off mainly during the few action sequences while dialogue levels were fairly clear throughout. Meanwhile, the audio for “Spider-Woman” is a DTS-HD MA 2.0 surround track that is OK, though it’s not as dynamic as the 5.1 channel track. Overall, Marvel Knights “Iron Man: Extremis” and “Spider-Woman: Agent of S.W.O.R.D.” are two decent motion comics which I’m certain will thrill fans of each character and the comic book they are based upon. For me, I’ve never been a big fan of the motion comic but even so, they are entertaining and at a low price is worth picking up especially if you don’t already own the individual DVD releases. Note: This Blu-ray is currently available at Best Buy as an exclusive before it gets a wider release in August.